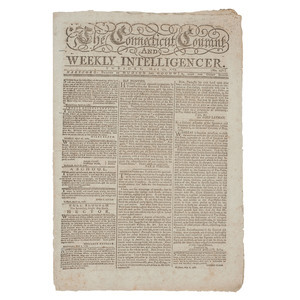 The Connecticut Courant and Weekly Intelligencer. 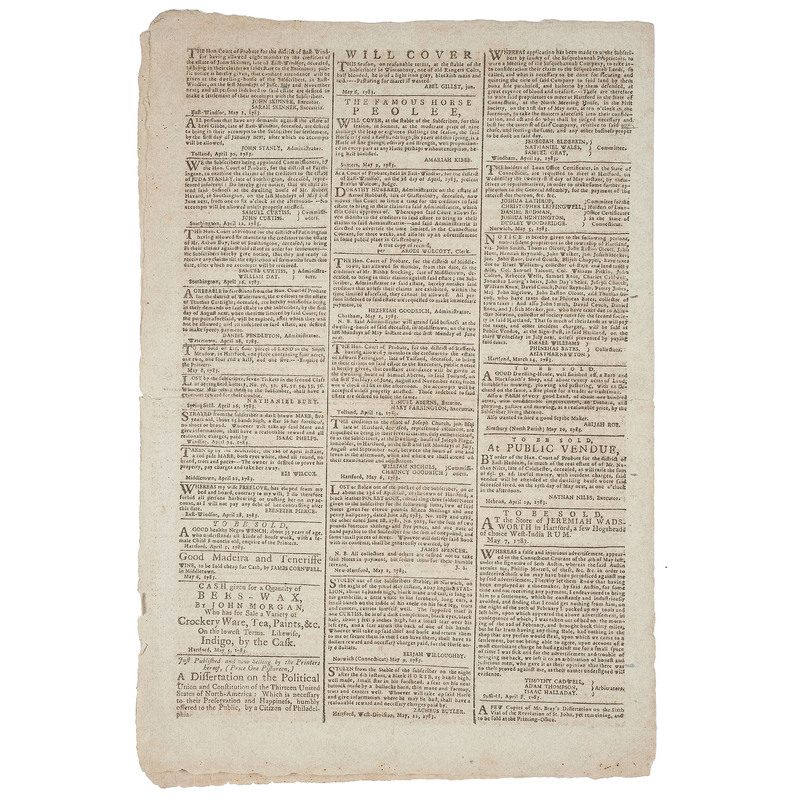 Hartford, CT: Hudson and Goodwin, May 20, 1783. No. 956. 4pp, 10 x 15 in. 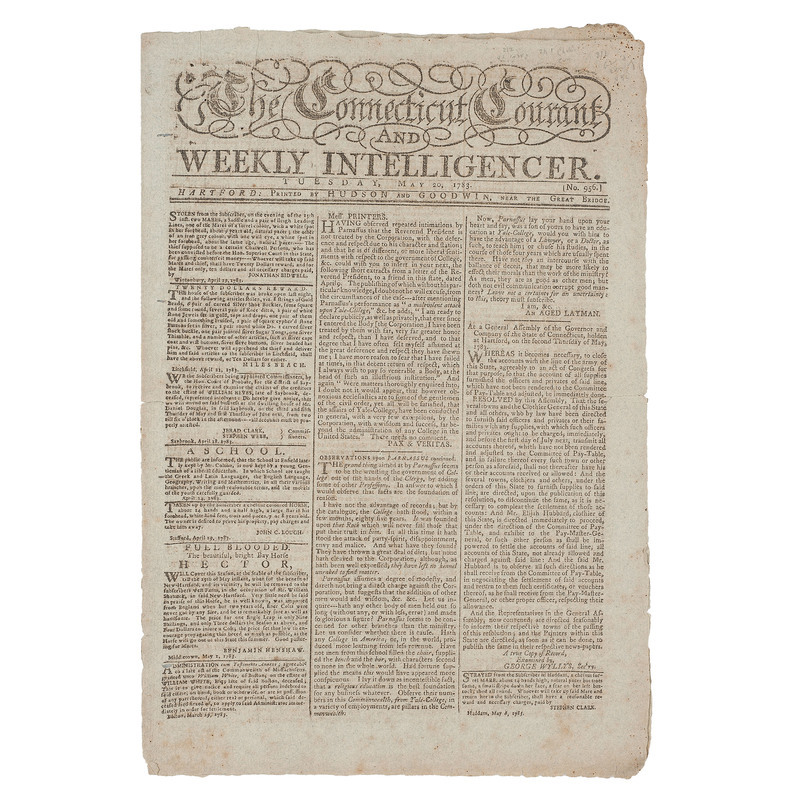 This issue contains news that the British now recognize the independence of the United States of America, marking the end of the Revolutionary War. 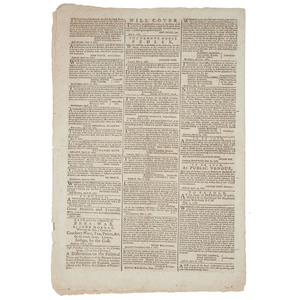 Also with coverage of the evacuation of Charleston, SC by British forces, as well as a meeting between George Washington and British General Guy Carleton in Fishkill, NY. 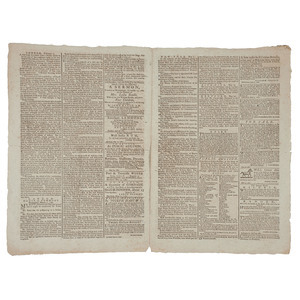 An inside page report from London's House of Commons presents "an abstract of a Bill for the provisional establishment and regulation of trade. 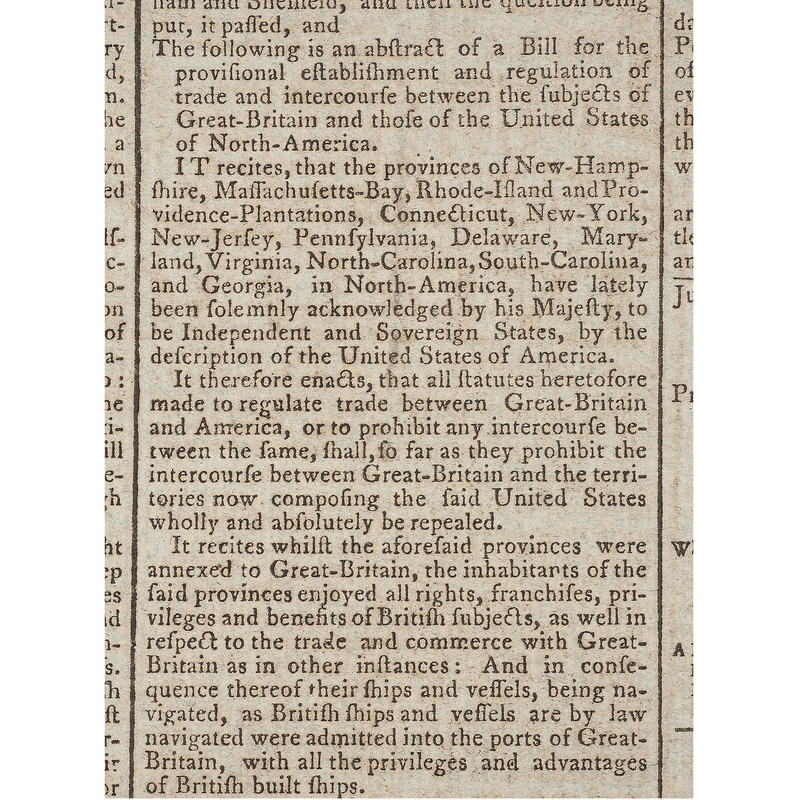 . . between the subjects of Great-Britain and those of the United States," wherein American independence is formally acknowledged: ". 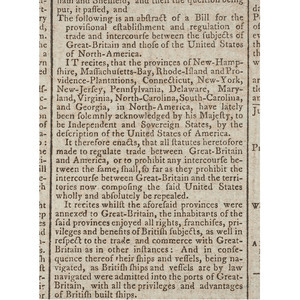 . . the provinces of New-Hampshire, Massachusetts-Bay, Rhode-Island and Providence-Plantations, Connecticut, New-York, New-Jersey, Pennsylvania, Delaware, Maryland, Virginia, North-Carolina, South-Carolina, and Georgia, in North-America, have lately been solemnly acknowledged by his Majesty, to be Independent and Sovereign States, by the description of the United States of America." 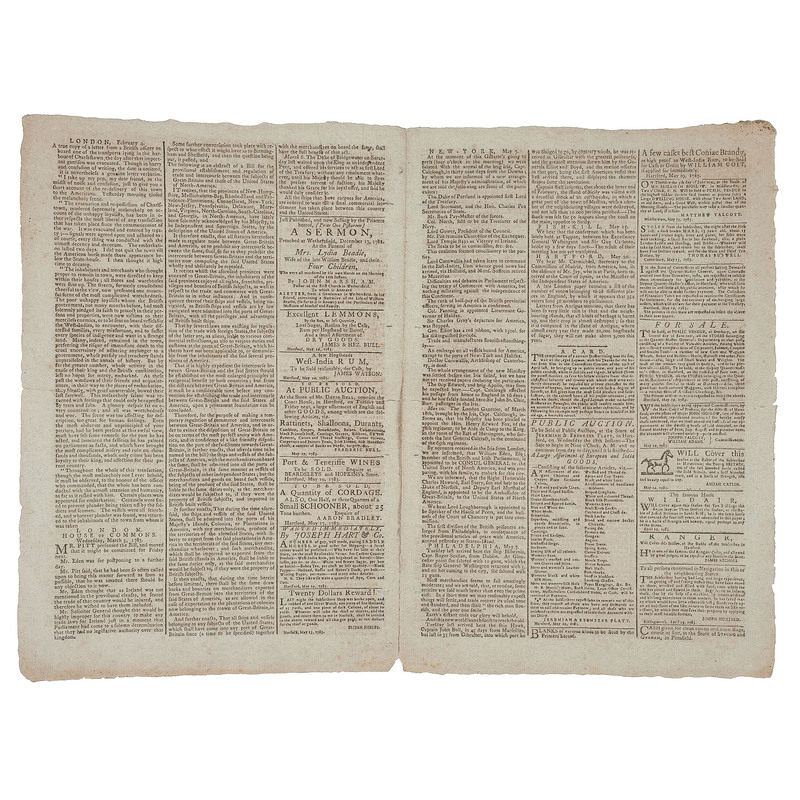 Reprinted on inside pages is a copy of a letter from a British officer aboard a transport vessel in the Charleston Harbor, apparently written the day after the evacuation. 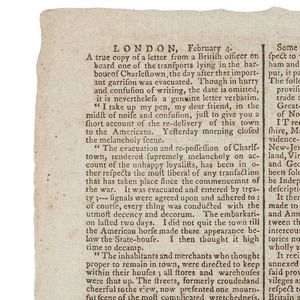 The officer describes to his friend the "evacuation and re-possession of Charleston, rendered supremely melancholy on account of the unhappy loyalists." 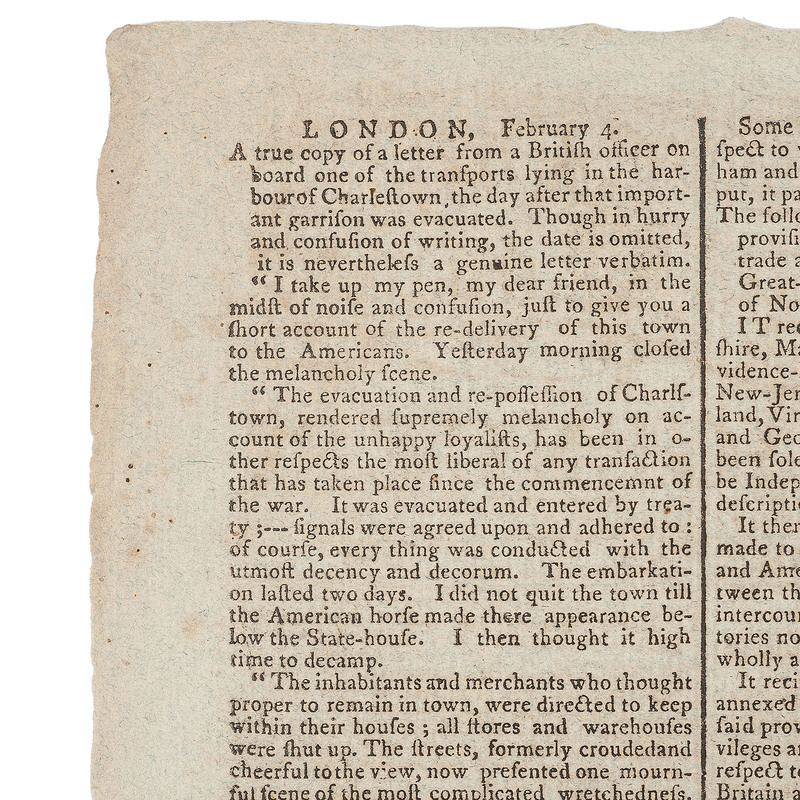 He writes in part: "The streets, formerly crouded and cheerful to view, now presented one mournful scene of the most complicated wretchedness. . .The poor unhappy loyalists. . . [were] to be sent on board vessels for the West-Indies, to encounter with their distressed families, every misfortune and to suffer every species of indigence. . . Many remained in the town, preferring the risque of immediate death to the cruel uncertainty of adhering any longer to a government, whose perfidy and treachery stands unparalleled in the annals of history." Finally, it was reported that a "conference, which has been lately held at Tappan, between his Excellency General Washington and Sir Guy Carleton" recently concluded, the result of which were the preliminary plans for the British evacuation of New York City, pursuant to the terms of the Treaty of Paris. Brittleness and creasing as expected, with some tears to edges and brown spotting at top right corner.